What better way to celebrate spring than by welcoming the migratory birds and their songs back to our winter weary landscape! 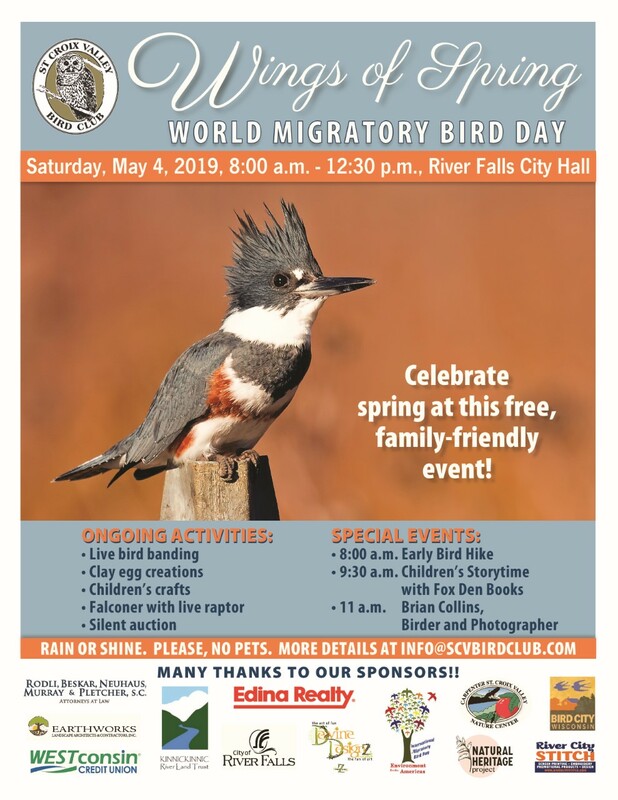 This family-friendly and informative event reflects our mission, via education and exposure, to encourage interest in birds and to promote habitat conservation and restoration efforts. Location: River Falls City Hall, 222 Lewis Street, River Falls, WI and along the White Kinnickinnic Pathway. As a Wisconsin Bird City, the City of River Falls most generously allows us use of these two ideal spots for our celebration. There’s ample parking in the City Hall lot on Lewis Street or at the Maple Street parking lot (at the trailhead to the White Pathway). “Protect Birds: Be the Solution to Plastic Pollution”. World Migratory Bird Day’s theme this year highlights the impacts of plastic pollution on birds, and the importance of adopting an eco-friendly lifestyle. By making changes individually and within our communities, we can make a difference in the fight against plastic pollution! To this end we will send home reusable shopping bags, complete with our logo and theme, to each famiy, while supplies last.